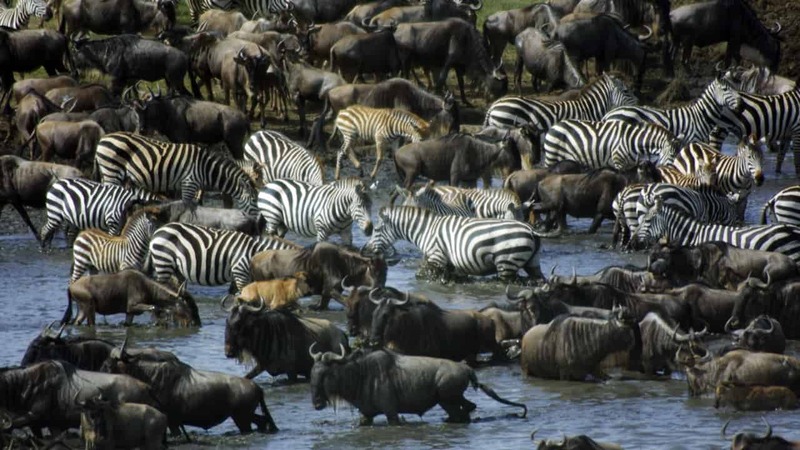 I have always wanted to visit the vast plains of East Africa and experience the greatest wildlife scenery and of course the famous wonder of the world, the wilde beest migration. I planned to cover the expansive Serengeti plains and the champagne-colored Kenyan hills where over 1.4 million wildebeest, over 200,000 zebras and gazelles migrate covering 1,800 miles every year in search for fresh grass. Contrary to my belief that I could visit any part of the Mara or Serengeti and have a spectacular view of wildlife, I didn’t find a lot of wildlife in the first few days of my visit. A solitary leopard here, a lone antelope there, and so on. I wanted to see the wildebeest migrating across the savannahs and at least catch a river crossing. The Kenyan guides told me that the wildebeest would be crossing in a week’s time. So I spent time canvassing the endless and treeless grass plains looking for any wildlife I could find and taking pictures while on a Land rover. It wasn’t much but the few glimpses of animals had been worth it. Every night for the first few days I would retreat to the Mara River Lodge after having cruised the hot plains and taken pictures of the solitary wildlife I could see. There are days when I didn’t leave the lodge because I preferred spending time by the poolside and just reading, then catching the beautiful sunset in the evening. I was beginning to lose patience because I had waited for the wildebeest for seven days now. I thought that maybe the guides had lied to me so that I could spend more money in my stay at the lodge. On the eighth day I had made up my mind to leave the Mara and go tour some other part of the country then head back home disappointed of course because I couldn’t catch the migration spectacle. The guides came on that very night before I went to bed and informed me that the animals had finally arrived. To date I often catch myself smiling at the memories of that awesome spectacle. I understood why it is classified as a wonder of the world. I woke up before dawn so that I could catch the animals grazing and all the hot action with the predators. I took my camera and was very excited when I got into the land rover. 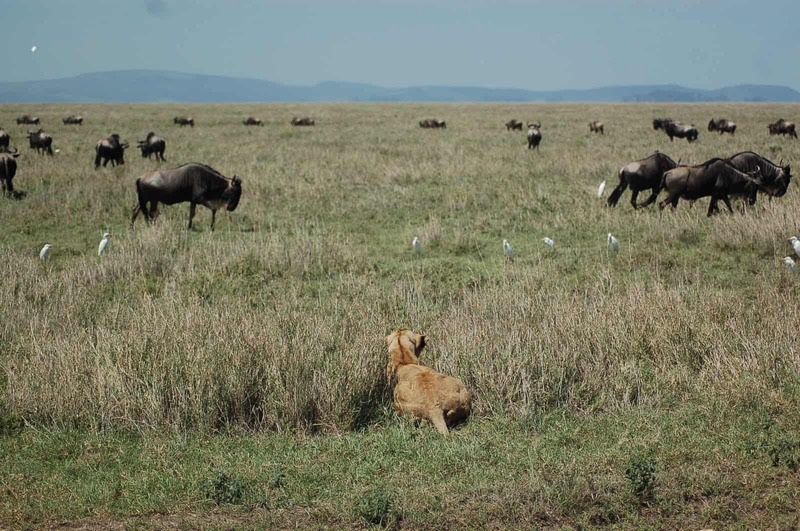 By the time we reached where the wildebeest were the sun had come out and the grassy savannah looked very beautiful. I could see a black mass at a distance before we reached the animals and when we got near the non stop mooing of millions of wildebeest welcomed us. I could see a pride of lions traipsing around and I could only take pictures. It was worth traveling halfway around the world to see the spectacle. The herds moved to another location and the silence afterwards was overwhelming. I took a break for the day excited because of my experience. The guides said the animals will be around for a week and I planned to follow them to the river when the crossing actually happened. I counted myself lucky because many tourists have traveled from far and wide to come and see this awesome attraction and gone back home without experiencing it. The days until the crossing I spent watching the animals and something that drove me crazy was the buzzing flies which were actually tsetse flies. However, the good thing about them was that they focused on the animals and not the tourists. I was also lucky to see a wildebeest birth, I actually took a video which is one of my prized ones. 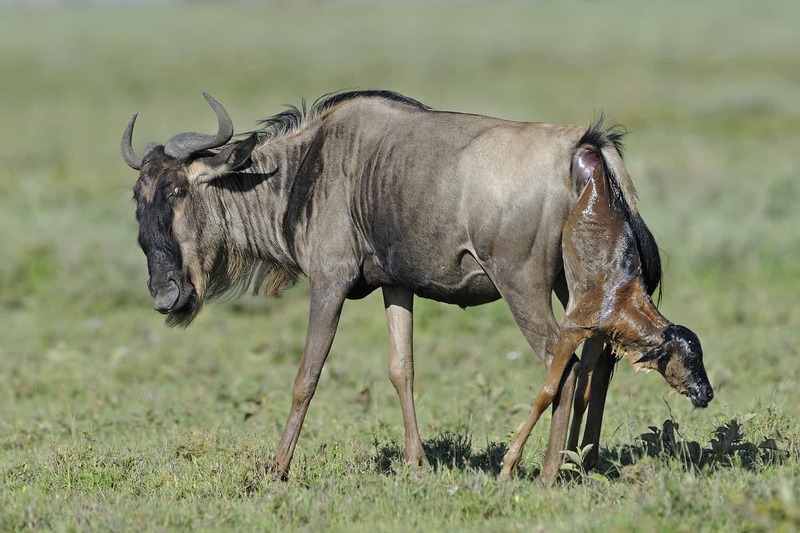 I watched the baby wildebeest learn to walk and suckle its mother. I just hoped mother and calf would survive the crossing. The day of the crossing I booked my space on a hot air balloon so I could have the best view. I watched the wildebeest, zebras and antelopes make their way across the river. The hungry crocodiles were of course waiting and I watched the crocodiles in action hunting the wildebeest. For hours I watched the millions of animals crossing the Mara river and after the crossing was over, I could see many animals dead on the river and at the banks. The vultures were at it feasting and the crocodiles had had their fill. It was an awesome tour and the migration is something I plan to experience at least frequently.